My friend Shaun Kenney – a man I love and genuinely admire – is upset (really upset) that Corey Stewart is the Virginia GOP nominee to face Tim Kaine in November (There Is No ‘Conservative Case’ For the Gauleiter of Prince William County). Like Shaun, I’m a Catholic and conservative. I am the grandson of immigrants – Irish on my father’s side, Slovak on my mother’s. Neither of my parents went to college, yet I am a lawyer and president of corporate affairs at a major direct marketing agency. I have the privilege of working for the great conservative champion, Richard A. Viguerie. What a country! I am blessed beyond what I deserve. I get to fight corrupt government, and write about constitutional and policy issues for national publications. My “dirty little secret” is that I can’t stand politics, but I get to collaborate with brilliant political minds and strategists. I donated to and voted for E.W. Jackson in the GOP primary. I would have strongly preferred Nick Freitas over Corey Stewart, but Corey won. I will vote for him in November. It isn’t even a close choice of whether I’d vote for anyone else. This November’s election is about America, not any of my differences with Corey Stewart’s positions or statements on any given issue. It is about preserving the Constitution through the appointment of constitutional justices and judges. It is about our national security, which includes the threat posed by our national debt. It is about economic prosperity and jobs for blacks, Hispanics, women, and even white males. It is about the First Amendment, the Second Amendment, the whole darn Bill of Rights. 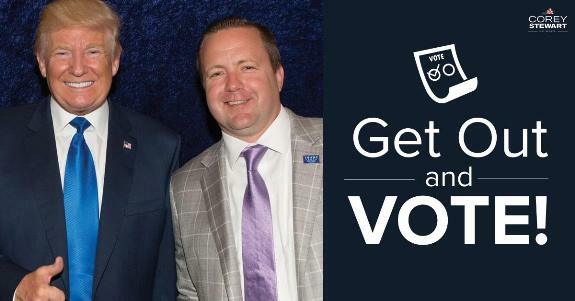 If you are a Virginian, to not vote for Corey Stewart is a vote against Donald Trump in what is really his second election. I am an unabashed supporter of Donald Trump and what he has done for America. It was not always that way. Early in the 2016 GOP presidential primaries, I considered him to be a patriotic but opportunistic Democrat. It was the support for Trump by another Catholic conservative, the late Phyllis Schlafly, which gave me pause to consider whether this man might be more than what I thought. And, boy, was I wrong. Trump is indeed patriotic, but he’s conservative. He’s opportunistic, but in the most positive sense. He has done more to expose the baseness, hatred, and flaws of the Democrats and the media than the entire Republican Party had hitherto done. I will be voting for Corey Stewart and against Tim Kaine for the right conservative reason: to save our constitutional republic. I am voting for the religious liberty that Trump has emphasized. I am voting for life. I am voting for equal treatment under the law. I am voting against government corruption and bureaucratic lawbreaking. I am voting against those who would destroy the First Amendment, which belongs to the people, not just major news organizations. I am voting against MS-13, against radical Islam that is intolerant of my faith (which is distinctly not my dear, peaceful Iranian and other Muslim friends), against race-based hate from “both sides,” and against socialism. My friend Shaun joins some other Virginia Republicans in sharing their disdain for Corey Stewart. Bill Bolling is one. I heard Bolling speak to a group of conservatives, thought he was one of us based on what he said, and donated to his successful campaign for Lieutenant Governor. He later turned on another Catholic conservative, Ken Cuccinelli, claiming the GOP had moved too far right -- or something like that -- when Ken was the nominee for governor of Virginia. There may be a tissue paper’s width of difference between me and Ken on issues, so Bolling turned on me. Bolling took my money, and got my vote before he did. Virginia turned bluer under Bolling, and I still can’t recall a single significant conservative thing he did. He certainly did nothing of memorable significance to expose the damage caused to America by the Democrats’ cultural jihad on Judeo-Christian values and the rule of law under the Constitution. I don’t recall Bolling doing anything to improve race relations. I write this the day my brother told me he recently quit a job in another state after the office manager where he had just taken the job called him a “damn Yankee” because his wife is black. Racism is immoral. It is inconsistent with free markets. It is stupid. The establishment GOP hasn’t done much if anything to fix the problem, and Democrats have only made things worse. Corey is called a white nationalist by some. I don’t see that what Corey Stewart says is a reflection on me. I do see Tim Kaine, Mark Warner, and other Democrats as dangerous to America’s future, and more harmful to people of all races. I see the unconstitutional acts of the deep state, the national debt, and the degradation of our Judeo-Christian values as far more dangerous than anything Corey Stewart could do as senator, if one were to believe the worst things said about him. I also know that if Stewart were to be elected and then betrays conservatives like Bolling did, we can defeat him in six years -- Nick Freitas time, baby. That contrasts with decades of momentum and dug-in roots of the forces working against conservatives and our constitutional republic, which are far harder to defeat and replace. But Trump -- Trump! – will have more minority votes in 2020 than any other GOP presidential candidate in over 100 years. I do see the effectiveness of Donald Trump in overcoming the damage Democrats and the progressive wing of the GOP have done to this country. I also see Trump as having become a more spiritual man, even to the point that he sees God’s plan in what he is doing, and that is reflected in his remarkable and brave leadership. I will be voting for Corey Stewart solely to preserve the Trump agenda. Hillary’s running mate Tim Kaine, perhaps a “nice man,” seeks to destroy the Trump agenda. That is the conservative case.